I try to make my soap tops interesting. Here, I stacked them. On the top is Rosemary Lavender with some dried rosemary incorporated into the soap. Next is Orange Anise, sprinkled with anis seed. 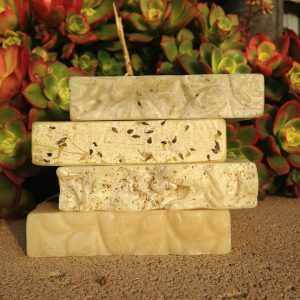 Herbal Mint is topped with crushed peppermint leaves, and the top of my Goat Milk soap is naked, with a fancy swirl drawn into the soap. Do you have a favorite soap top?